I just want to be able to watch TV shows and play games on my PC wherever I’m most comfortable. It’s not an unreasonable request, but despite throwing countless hours of effort and more money than I’d care to think about at this problem, I just couldn’t crack it. I’d like to thank NVidia for ending my torment. 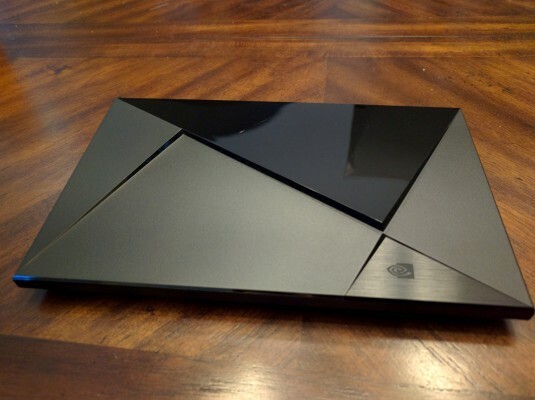 When I saw the NVidia Shield TV, I was somewhat dismissive. It’s another Android-based platform promising to unify my entertainment experience, allowing me to push media and PC games around the house with ease — something every device I’ve tried has failed to do. NVidia claimed that this device could not only handle my TV streaming habits, but could also sling gameplay to a connected TV, using the power of my recently-rebuilt desktop. Before we get to how that went, let’s talk about how my frustration reached a level where I threw an electronic across the house. It’s far smaller than I expected, but don’t let that fool you. I’ve recently moved from my house in Phoenix, Arizona where I spent the last decade, to a two-story house in Fort Worth, Texas. Knowing how much of a colossal pain getting wireless to serve every room was in a 1400sq/ft home, I knew it’d be more than impossible in one exceeding 4200sq/ft. (They build BIG houses in Texas!) Crawling through the rafters, I ran CAT6 cable to every room in the house, but could not reach the front room due to the concrete structure between the two floors. I figured that, with the wireless router being roughly 30 feet away, I should be able to use an Amazon Fire Stick to watch shows on Plex, Hulu, Netflix, and Amazon streaming services. Instead, I found myself pacing a path between the router and the front room as I rebooted one or the other nearly every day. For whatever reason, Amazon’s implementation of the Fire Stick has a severely unstable network stack. Doing a bit of observational research I found that it would stay stable, bouncing from Plex to Netflix, for somewhere between 36 and 48 hours. At that point the buffering would begin. I would have to pause the show for half a minute or so to allow the device to ‘catch up’, only to have it pause and buffer a few minutes later. The router is capable of pushing over 2000gbps of speed through the air, so anything I was planning to stream should have zipped over in an instant. Instead, I had to unplug the device from power, wait a few seconds, and power it back up. Normal TV watching would resume, and everything would work fine for another day or two. I spoke with Amazon regarding this issue and finally ferreted out that “that’s somewhat normal — you should use a wired connection” from the support agent. Where, exactly, do I plug in a wired connection on the wireless FireTV? Stellar support, right there. Determined, I decided to test that theory. I purchased an Amazon FireTV and put it upstairs, connecting it through the aforementioned Ethernet I had ran through the walls. It worked like a champ. I couldn’t remote stream my PC games to it, but that’s one problem solved, right? It turns out that the FireTV has a lock-up time of about a week before it started in with stuttering problems as well. Frustrated, I swapped my router. I replaced my Netgear Nighthawk X4 with an Asus AC3100. While the range on the device is capable of reaching every room in the house, the Fire Stick still performed like a device that I’d like to stick in a fire. After a tough day at the office, I sat down to watch a bit of House of Cards and the Fire Stick decided it was having none of that. Jerking the tiny thumbdrive device out of the HDMI port of my TV, I hurled it across the front room, sending it skidding across the floor with a cheap plastic skitter as it hit the wall. I’d had enough, clearly. The NVidia Shield TV bills itself as a micro-console. It isn’t. The NVidia Shield TV isn’t a console platform any more than the phone is, the Ouya was, or any of the other also-ran Android-based platforms are. What it is, however, is the most powerful set-top box this side of a PC. Absolutely silent, the device is a sleek unobtrusive method of bringing (nearly) all of your entertainment into one space. Measuring only 1.0 x 8.3 x 5.1 inches, and weighing just 23oz, the NVidia Shield TV can stream Netflix, Hulu, HBO Go, Google Play (movies, music, TV, and apps), as well as a whole slew of app-based streaming services like TED, MLB, Pandora, and Crackle. It can also stream games from a PC with at least a GeForce 650 series video card. True to its Android roots, it can also sideload photos, video, apps, and anything else you have local that works on the OS. To support all of this functionality, the NVidia Shield TV has a robust set of ports for input. A Gigabit Ethernet port handles the speed required for 4K streaming at high framerates, when paired with the HDMI 2.0 port (HDCP 2.2) for 4K output and high quality 7.1 surround sound audio. Two USB 3.0 (Type A) ports provide a place to connect an external hard drive, webcam, keyboard, mouse, or nearly any other USB device with Android support. A nearby microSD slot offers additional storage options up to 128GB. Not as visible, obviously, is the 802.11ac 2×2 MIMO wireless and Bluetooth 4.1 support. Both of these technologies are capable of supporting headsets, controllers, and other devices — again, as long as there is Android support. Ports. So many delicious ports! Under the hood, NVidia has packed their own Tegra X1 processor. The Tegra X1 is a quad-core ARM Cortex-A57 design, running at 1.9Ghz — double that of the Fire Stick, and two more cores than the FireTV. Paired with this processor is a dedicated 1Ghz Maxwell GPU — the key to handling the vast array of supported video and audio codecs. With the knowledge that the device could handle any video I threw at it via a portable hard drive, I wanted to see how it handled the real test: streaming. The Amazon Fire Stick is capable of 802.11 b/g/n, but the ac and MIMO support of the Shield should be sufficient, right? I fired up a short video of my wife driving a Formula 1 trainer car and sent it careening across our living room to the Shield TV. Without buffering, stuttering, or complaining in any way, the video (and my wife’s racecar) roared to life, sending the 300mb five minute video streaking across the finish line without a hitch. I’ve been chasing this outcome for far too long and now I have it. Emboldened by the paltry 300mb file I streamed, I pushed the envelope up to an episode of Wishbone. The 4:3 low-quality adventures of a little Jack Russel Terrier recounting classic stories like Frankenstein and Joan of Arc come in at just shy of 500mb, and they too padded their puppy paws painlessly past without so much as a bark. A little more bulky, but not uncomfortable. Testing the cord-cutter’s conundrum, I fired up a saved episode of Arrow to see how the Shield TV handled a 1500mb file. It turns out that it handles it just as well as a file four times that size. In the past few weeks, the Shield TV has turned into our media streaming box, our Netflix source, our Pandora machine, and our locally stored music jukebox courtesy of Google Play. The only thing missing was Amazon’s movie library. Circling back to the USB ports on the side of the device, I connected up my PC and opened up the file system using the ES File Explorer app. After creating an APK folder on the Shield TV, I simply copied over the APKs that I wanted to load (i.e. Amazon App Store) and used the stock “Package Installer” to get it installed to the system. If you’ve ever installed an app on your phone, you have a good idea what this looks like. Sideloaded apps, such as the Amazon App Store, don’t show up in the main navigation panels of the Shield TV, but that can easily be solved with another sideloaded app — specifically, Sideload Launcher. It creates a folder where all of your sideloaded applications are stored. The Shield TV does a good job of translating swipes into analog movements on the Shield controller, but you could also just as easily plug in a USB mouse or use something Bluetooth. NVidia has built an incredibly flexible and permissive system, and that’s something tinkerers like myself can appreciate. “Don’t hibernate in your office all day!” used to be a common complaint from my wife. To combat this, I purchased an OriginPC and connected it to the TV with HDMI out as she likes to watch the games I play. If there is a more expensive solution to this problem, I’m not sure what it’d be. Sure, I could run a very long HDMI cable from my PC to the front room, but that doesn’t solve the control issue. I made an attempt at solving this problem, twice. I tried the Nyrius ARIES Pro, but found myself struggling with the same controller issue. Bluetooth controllers could reach my PC, but the ARIES relies heavily on line of sight, introducing more than a little video stutter and lag. There were DIY options courtesy of systems like the Raspberry Pi, but I was looking for something fully baked. NZXT’s DOKU held promise, but reviews revealed a device only marginally better than the similarly-priced OUYA. Frustrated, I did exactly what my wife asked me not to do. Ordering a whole host of cable extenders, I ran an extra long pairing of HDMI and USB extension cables. It worked perfectly…if you don’t count the unsightly mess I had to haul in and out of my office every time I wanted to do some couch gaming in the front room. The final straw was punctuated by an ear piercing howling screech from my little Rat Terrier, Loki. Loki lost one of his back legs to cancer, and he can’t jump. He didn’t want to try to walk over the cable snakes, and he was ‘trapped’ in the hallway. I picked up my little guy and disconnected this mess for good. A Loki at rest tends to stay at rest. Still running on WiFi, I fired up the Shield TV and tried out the GeForce GameStream. Using the included NVidia controller (more on that in a bit), I fired up the app and it found the Steam library on my desktop and laptop instantly. In a Big Screen Mode-esque presentation, it offered up most (but not all) games in my Steam library. I fired up Batman: Arkham Knight and breathed a very deep sigh. The GameStream logo stood proudly on the screen while the ever-familiar spinning circle prompted me to be patient. Patience paid off, and after roughly a minute the game stuttered and stumbled across the line. Despite being the only device on the WiFi, the 1080p stream at 60 frames just wasn’t happening. I made a trip to Best Buy and purchased a Powerline adapter from Netgear. The Powerline adapter uses the in-house electrical wiring to provide wired connectivity. I’ve had moderate success, but nowhere near the gigabit speeds advertised, but I figured it had to be better than fighting with WiFi. With an Ethernet connection, all of my problems were solved. GameStream came to life and within five seconds, I had the familiar Arkham Knight introduction. I followed that success with The Witcher 3: Wild Hunt, Fallout 4, Assassin’s Creed: Syndicate, XCOM 2, and Tom Clancy’s The Division. With enough bandwidth to support it, the Shield TV was more than capable of handling any game I threw at it, streaming at higher qualities than even my OriginPC could muster. It’s not my bag, but it is worth noting that the NVidia Shield TV is also the only device currently capable of directly streaming all of this gaming goodness to Twitch.TV. There is a native Share app that provides that functionality for those who are into that sort of thing. What’s in the box, besides the box? In addition to the Shield TV device, the system ships with the aforementioned Shield controller. A bit more chunky than the Xbox One or PlayStation 4’s interface devices, the Shield controller has had a few iterations to get to this point. As you can see below, it looks like a bit of a hybrid. The sticks are parallel like you’d find in something from Sony, but the overall look and feel certainly says Xbox. Unlike both of those devices, however, the batteries in this controller last for upwards of 40 hours. I’ve been using it off and on for weeks without a hitch. In terms of weight, the Shield controller has a bit more heft, but none of that made an impact on its comfortable use. The lag between the controller and the Shield TV is essentially zero, making remote games of Broforce just as possible as breaking out brooding Geralt in The Witcher 3: Wild Hunt. The difference, of course, being that with the power of my PC backing up the Shield TV, I could run it with every bell and whistle fully enabled. NVidia Hairworks never looked as good. I did have an issue with the Shield Controller after the most recent OTA update — I can’t turn it off. I imagine it’s a bug, but my remote seems to run until the Shield TV falls asleep, and I cannot find any sort of button combination that will send it to sleep. It has a 40 hour battery, but it seems wasteful to not have a way to shut it off. As an addon (or if you order during one of their special sales), you can also pick up the Shield TV’s sveldt little remote. While the Shield TV is compatible with my Harmony Remote, there were a few features that interested me with this accessory. There is a touch-sensitive strip running the length of the device that controls audio at the slide of your finger. Above that is a pair of dedicated buttons. The arrow pointing left is your back button, and the one that looks like a circle is the home button. Nestled below those two is an admittedly large voice-search button. On the top of the remote is an unmarked circle that serves as your selection, as well as cursor control. While all of that is somewhat stock (Amazon’s device now support voice search), the small audio jack is somewhat more rare. I’ve seen this on Roku devices, but this welcome feature is largely absent elsewhere. My wife likes to listen to Pandora while she works around the house, and this allowed her to throw in a pair of earbuds and do exactly that. Despite the large house, the Bluetooth controller in the Shield TV allowed her to float around the house without an issue. I also paired her Panasonic headset with the Shield TV — something I couldn’t do with any of the Fire devices. Better still — this functionality also appears on the bottom of the Shield TV Controller, allowing for quiet late-night gaming without stringing a cord over to the TV receiver. There’s an ever-raging argument between Apple and Android users over which store has the better application support. Apple’s closed-system approach keeps quality somewhat consistent, but the walled garden approach also hampers homegrown applications. Android is a bit more wild-west in its approach, and that means a lot of copycat applications. It also means that it is highly hackable. As I mentioned before, sideloading on the Shield TV is remarkably easy. I’m not a huge fan of the stock Google video and photo viewer. With the Shield TV, I didn’t have to be. Unlike Apple’s AppleTV or Amazon’s FireTV/Firestick, I could easily swap out that application with something like VLC, MX Player, or the dozens of other quality video applications. Similarly, loading up apps like Pandora, Netflix, Hulu, HBO Go, Showtime, and others is as easy as searching for it on the device, or sideloading it via your network, or an external interface like a USB stick. Beyond traditional applications, all of the content you’ve purchased on your Google account is readily available on the Shield TV. Knights of the Old Republic, Portal, and all of the various freebie RPGs are a snap to install, and if emulation is your thing, you can expand this to your wildest dreams. With the native controller, it’s certainly less of a headache than trying to replay Pokemon Yellow on your phone’s touchscreen. As it stands, emulation on the Android platform covers just about everything from the Atari 2600 to the Sony PSP, with PlayStation 2 and Gamecube emulation heading towards playable very soon. I personally loaded mine with MAME (Multi-Arcade Machine Emulator) and enjoyed some Black Tiger for my efforts. Zenny! GeForce Now is a subscription-based games-as-a-service product. Using cloud servers distributed throughout the world, GeForce NOW delivers games like Dragon Age Inquisition, Batman: Arkham City, Mad Max, The Witcher 3: Wild Hunt, and many more. If you do not own a console, or a high-end PC to play games like this, the $7.99 a month pittance is very attractive. Best of all, there is no risk — the service has a whopping 90-day free trial! One of the things I really liked about GeForce NOW is that, if you meet the minimum requirements mentioned above, they give you an idea of what you can expect. For instance, Tomb Raider has a small symbol that says “1080p60” signifying the resolution and framerate you’ll see with the service. Geforce Now’s expanding game library. Using GeForce Now isn’t as simple as plugging in the Shield TV and somehow a rainbow of 1080p 60fps magic pours from your TV — you’ll need a speedy connection to the Internet. All of the heavy lifting is handled by NVidia at one of their seven data centers, but you’ll need between 5 and 10Mbps for 720p and between 30 and 50Mbps for 1080p streams. Toss in higher framerate games and you might need to edge those numbers up just a little bit as the refreshes are more constant. I have a 50Mbps cablemodem service and was using the Shield TV via a wired Ethernet connection, so I figured that should be more than enough to handle whatever the service had to offer. After a quick analysis of my connection, including bandwidth, frame loss, jitter, and ping, I loaded up Street Fighter X Tekken. After just a 13 second load time, I was already looking at the menu for the game. The video looked a little interpolated at first, but quickly snapped to its 1080p 60fps promise. I did see an infrequent jitter in my video stream, but that likely has more to do with my ISP than the service. I saw solid results in BlazBlue: Calamity Trigger, Darksiders, Ultra Street Fighter IV, and everything else I could throw at it. For kicks and giggles, I ran the benchmarking system to see what sort of hardware was detected behind the scenes. This particular node I was streaming from was running on Windows 8 64-bit with an Intel Xeon E5-2670 CPU at 2.6GHz, 16GB of RAM, and sporting and NVidia GRID K520 graphics adapter for 1920×1080 resolution using 4x MSAA. What does all that net you? How about a staggering 199 frames per second? I went in and bumped the graphics options to the max (C16xQ MSAA and Ultra shadows) and saw that number drop to a still-incredible 149fps. It seems like there is more than enough hardware to handle whatever NVidia plans to put on this service. Sleeping Dogs also has a benchmarking mode, so I cranked that up to the extreme and saw an average framerate of 35.2fps. I noticed that no other reviews showcased the GeForce Now and Gamestream service in a way that let you see what you are really getting. I hope to remedy that with the video below that shows both of those services in action. The only thing I don’t particularly like about GeForce Now is that it may need to be updated to keep up with the demands of the current crop of games. Cranking up options like Ambient Occlusion and NVidia’s own PhysX technologies requires serious hardware and the K520 most compares to a GeForce 770 as the K520 is built around multiple simultaneous users. On the K520, Arkham Origins delivers a rock-solid 56fps average, but Tomb Raider (one of the newest games on the platform) chugs to an average framerate of 20.7fps when TressFX is turned on for Lara’s hair. The games on the GeForce NOW service are pre-set to optimal settings, but if NVidia wanted to showcase their amazing technology at the highest possible settings, this would be the perfect place to do it. If this sounds a little bit of a love letter for the NVidia Shield, there are some aspects where the rose is off the bloom. NVidia offers only a one year warranty on the Shield. You can certainly couple that with something from a warranty company like SquareTrade, but for the asking price, only a year’s support feels a little short. While it is possible to sideload apps, if you aren’t the tinkering type you won’t find support for Amazon’s streaming service. This means that much of the ‘featured’ content you’ll see appear on the dashboard comes from Google Play. This isn’t necessarily NVidia’s fault, but it’s a reality of integration with Google’s Android TV service. To mitigate this issue, I found myself using the built-in Chromecast support native to the Shield TV. I could easily find what I wanted on my phone then simply ‘shoot’ it to the Shield TV to display. It turns my Nexus 6P into a remote control of sorts, but it also makes for a good workaround. I like the GeForce Now offering from NVidia, but I recognize that it’s a service aimed more at those who do not own high-end gaming PCs than not. I’m not sure I’d call it a console, but I would call it console replacement-lite. NVidia is dipping their toe into the “buy and instantly play” market, adding more recent titles to their offering, but the catalog is still a little shy of robust. That said, coupled with a 3-month free trial, there’s no barrier to entry. Wait — what about Apple TV? Those of you who know me personally know that I bleed Android green, through and through. After listening to a few of our readers and Editors go on about the slick interface of their Apple TV devices, I wanted to put it up against the Shield TV and see how it stacks up. If you want to skip to the bottom — let’s just say that it doesn’t, and that’s not some sort of Android-based bias talking. Apple TV — Sony Vita for scale. Apple would have you believe that the Apple TV is their play at the console market. That’s no more true than when Google said it. Put simply, and rather irrefutably, the Apple TV experience is the same as it is on your iPad or iPhone for the vast majority of games. The included remote is meant to be controller analog with its touch surface acting as your virtual D-Pad, but I ask you this — is it any more comfortable when you do this same trick on your phone? Awkward and cramped, the remote makes for a poor interface for any shooter you might want to play, best suited for games that aren’t time-sensitive like RPGs. Similarly, there are no face buttons, analog sticks, shoulder buttons, or triggers. If Apple was serious about gamers, the Apple TV would have shipped with a controller. Instead, Apple expects users to snap up something from a company like Power-A or Steelseries to do their heavy lifting. The remote for the Apple TV is, for all intents and purposes, a Wiimote. Complete with wrist strap, the accelerometer-based remote was designed around motion based games — something the Xbox One and PlayStation 4 have both all but abandoned. Apple may have worked on this device for the last few years, but in that time the gaming world has passed it by. Looking under the hood, I was surprised to see that the Apple TV sports an Apple A8 chip — the same one that shipped in the iPhone 6. The iPhone 6S and 6S Plus both shipped with the A9, with the 6-core A10 right around the corner. While I can’t say that I saw any slowdown with the A8, I figured with all the hype around this device that it would sport the latest and greatest processor from Apple. In terms of price, there is a bit more parity between the Apple TV and the NVidia Shield TV, with the slight edge going to the Shield TV for the included controller. Apple has a 32GB version of their Apple TV priced at $149, with their 64GB version coming in at $199 — the same as the Shield TV. These ports are not the gateway to 4K UHD content. But here’s where things went sideways — 4K. Apple puts over 100 engineers on their camera technology, but they should have spared a few for their video side of the house. Roku, FireTV, and the Shield TV all adopted the UHD 4K standard, and somehow Apple completely missed the boat. Sure, you can hack the process and stream it through a convoluted pipe of software and other devices (5K Player through a Mac or PC, or slinging it from your iPhone 6S or 6S Plus) but the point is this — everyone else is doing it natively. If there is one thing I know about Apple’s roadmap, it’s that we’ll see another Apple TV version announced by the time it takes me to type this review. There’s no 4K today, but I’m sure Apple will hike the price and offer it next year, or the year after that. Sideloading, on the other hand, will reside firmly in the realm of jailbreaking and other kludgy hacks. If you’ve tinkered with offerings from knockoff players in the Android market, more reputable devices like the Asus Transformer, or even with Google’s own devices, you’ve likely got a good idea of what the NVidia Shield is capable of. The difference here is that, with this much hardware under the hood, it does it faster and better. Every app snaps to life, Plex doesn’t hesitate or buffer, and all of the applications I threw at it were gobbled up with ease. The Shield TV is the crown jewel of all Android-based products, for certain, and from my testing easily takes the top spot for streaming. Add in the GeForce NOW service and the ability to stream locally with GameStream, both of which are only available on the Shield products, and the Shield TV becomes the only game in town. The Shield TV delivers in every test I could throw at it. It destroys Amazon at their own streaming game, the slick interface, solid search functionality and 4K support stomps Apple, and the inclusion of local and subscription-based gaming makes it the only choice. I finally got to sit down and watch that House of Cards episode, and thanks to the NVidia Shield TV, I got to do it in glorious 4K HD, following it up with an adventure as Geralt of Rivia, and all without a single stutter -- as it should be.